My husband and I went on a date the other night to 'Focus by James' at Springwood. We normally enjoy a degustation meal when we go out and were happy to find that Focus provided 4 double courses, rather than 7 or 8 single courses; which meant we could have a fancy multi-course meal without being out too late on a 'school' night. 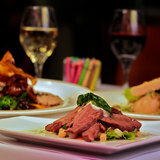 This restaurant offers an elegant but cosy fine dining experience. Upon further inspection you will notice the classy white tablecloths have a large sheet of paper on top with a discreet glass of pencils and crayons in the corner of the table; so if your date turns out to be a boring loser, but you are still waiting for dessert, you can pass time by drawing on the paper tablecloths. If all else fails you can stare blankly out the second story window at the Pacific Motorway, which sounds lame, but is actually quite interesting to look at. I was surprised to find that the degustation was only $75 per person or $100 including matching wines. I was able to use the $25 voucher I got for signing up to their email list a few weeks earlier. We opted not to get the matching wines, which meant the only bad thing I can note about the evening, was that I couldn't remember the name of the awesome wine I had the last time that I was there. My husband loves working his way through their craft beer selection, so we will definitely be going back so he can finish his 'assessment' of the other beers. We have always gone on a weeknight and it has been pleasantly quiet ensuring we had quick service each time. On a Friday night you can enjoy live music while you eat.